Roxana Garcia ’13 and Zac Belok PI ’15 hold their places at the Smith Campus Center courtyard fountain as part of a performance put on during Pomona’s Founders Day festivities in October. 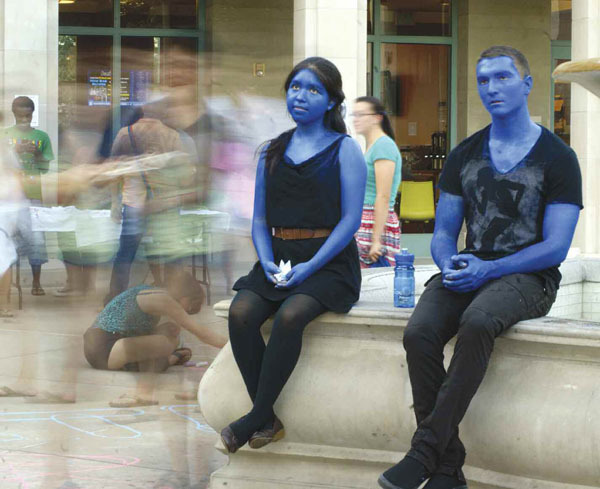 The pair was among a larger group of students in full blue makeup sitting still for one hour and then slowly mirroring one another’s movements. “Blue Mirror” came out of the Site Specific Performance Class taught fall semester by guest artist Jessica Harris ’11, who returned to Pomona last year to finish her degree after dancing professionally for nine years in New York. Other class performances included “Musical Stairs,” in which students, wearing black, lined both sides of the Frary Dining Hall entrance stairs. Each student focused on a single stair and sang “what” in a soft voice as passersby stepped on the stair. Another event celebrated the symmetry and geometry of the Stanley Academic Quad, with students aligning their bodies with the natural lines in the space, creating tangents, parallels and other shapes.